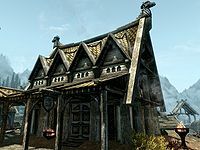 Belethor's General Goods is a store in Whiterun's market area of the Plains District. It is located next door to Arcadia's Cauldron, opposite The Bannered Mare. As a general goods merchant, Belethor buys and sells any type of item. His assistant Sigurd helps out around the shop and is often outside chopping wood at the wood chopping block on the northwest side. The shop is open during normal business hours, from 8am to 8pm. It contains only one zone, the interior. NOTE: Like all other stores, Belethor's General Goods has a number of fixed wares on display scattered around the main trading room. These can be bought from the proprietor, Belethor, and will disappear from the room when purchased. For a list of these special items, see this section. Entry is into the main store, with a large firepit against the southeast wall, which has an empty pot hanging over it. The counter comes out from the northwest wall and extends about halfway across the room. The counter is filled with displayed merchandise that can either be bought or stolen, while under the counter is a bowl. There is a low table in front of the counter and a dresser with a couple of display racks full of displayed merchandise on top against the northeast wall. On the northwest wall there is a row of three wall shelves coming down the wall in the row, with a chair and small dresser further to the left. There are two doors out of this room; one in the eastern corner and one in the southern corner. There is also a doorway behind the counter in the middle of the southwest wall. To the right of the door in the southern corner is a cupboard with a copy of the Speech skill book Biography of the Wolf Queen. Behind the counter against the southwest wall, to the right of the door, are two sets of shelves holding displayed merchandise. In addition to the displayed merchandise around the room there are several bowls, plates, goblets, a candlestick, and many food sacks. The doorway leads to a back room that has the second entrance in the eastern corner, with a firepit in the southern corner which has an empty pot hanging over it as well as two bunches of elves ear and two salmon hanging from the ceiling above. Beside the firepit, against the southwest wall, is a cooking pot on a stand, while in the western corner there is a small square wooden table and two chairs. On the table is an Eidar cheese wheel and a loaf of bread on a plate with a goblet. Above the table on the northwest wall are two wall shelves holding various plates, cups and a bowl containing a gourd. The door in the southern corner leads to a collection of crates and barrels under the stairs leading up to the top floor that is accessed through the other door in the eastern corner. 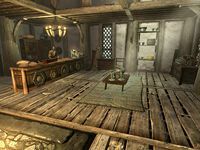 Climbing the stairs leads to the living quarters with only a third of the floor being slatted in an L-shape, with a door on the left that leads to Belethor's bedroom. In the front is a dresser with the business ledger on top. To the right along the northwest wall is a low table and chairs. On the table is an apprentice locked strongbox containing random items, a bottle of Nord mead, a bottle of alto wine, a bowl, a plate, and salmon steak on top. In the northern corner is Sigurd's single owned bed. Belethor's bedroom consists of his large double bed in the middle of the northwest wall with an end table on either side and a set of shelves holding nothing of interest against the northeast wall beside the door. This is the merchandise found in Belethor's merchant chest. These items are only available if purchased from the merchant; they cannot be pickpocketed or stolen. They are restocked every two days. There is a "Loot" shadowmark to the right of the entrance door. The game has a preference for the rear door on the southeast side; even if you enter via the door from the market, your follower will enter using the other door, and all quest targets outside the shop will point to the rear door. All containers in the area are non-respawning and safe to store items in if you wish, with the exception of some barrels and sacks. This page was last modified on 2 January 2018, at 04:10.